When Mountain Bull and Satao—two of Kenya’s oldest and most famous elephant bulls—were killed by poachers inside two national parks, the deaths sent shock waves through Kenya’s conservation community and around the world. Poached for their enormous ivory tusks, Mountain Bull and Satao should have been well-protected, both by their fame and national park boundaries. Instead, in early May, poachers armed with spears illegally entered Mt. Kenya National Park, killed Mountain Bull, and hauled away his ivory. A few weeks later, poachers breached the border of Tsavo East National Park, killed Satao with a poisoned arrow, and ferried away his tusks. Where these majestic bulls once roamed for more than four decades—surviving even the ivory wars of the 1970s and 1980s—their carcasses lay still and sprawled in the dirt. With the outpouring of eulogies and tributes that followed their deaths, Mountain Bull and Satao put a face on the tens of thousands of African elephants killed every year whose ivory, in some parts of the world, is worth more than their lives. Beyond the loss of two beloved elephants, the deaths of Mountain Bull and Satao may be indicative of a larger tragedy unfolding: an end to the era of big tuskers. Douglas-Hamilton adds that if left alone, these big elephants, which typically bear the larger tusks, will father the majority of calves. Centuries of poaching and overhunting, however, have relentlessly cut down big elephants at the height of their reproductive power, with an observable impact on the size and weight of elephant tusks. Tusks are teeth—upper incisors to be exact. During the first year of life, a baby elephant’s tusks will replace his set of milk teeth, extending from a socket in the skull. Prying bark from trees, digging for water or roots, fighting other bulls—elephants’ tusks perform a variety of functions. According to Dr. Joyce Poole, an elephant ethologist and co-director of ElephantVoices who, as an AWF researcher in the late 1980s, studied the effects of poaching on East Africa’s elephant populations, tusks continue to grow throughout an elephant’s life, becoming longer and thicker generally with age. Male tusks can grow to be seven times the weight of female tusks as they age. Poole notes that even if younger, smaller males with the potential to develop large tusks remain in the population, they will not be the primary breeders given that age, body size, and musth—a frenzied, sexually charged state for male elephants during which hormone levels are elevated—determine how often and successfully a male elephant breeds with females. Smaller tusks are not the only genetic consequence faced by elephant populations in Africa (and Asia) due to heavy poaching. Over several decades, researchers have documented an increase in the percentage of tuskless males and females in a number of elephant populations. 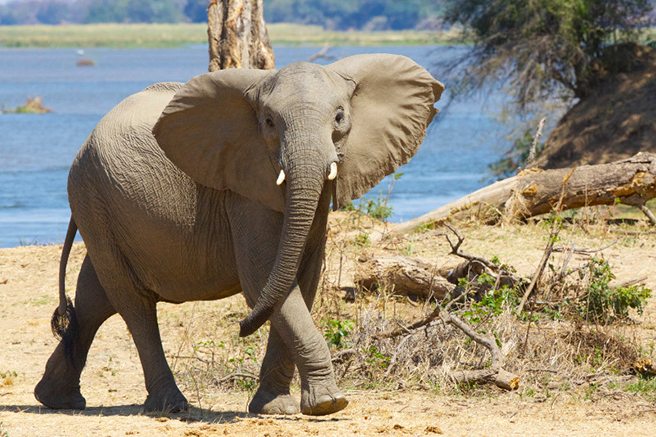 A 2008 paper published in the African Journal of Ecology noted that the number of tuskless female elephants in Zambia’s South Luangwa National Park and adjacent Lupande Game Management Area had increased from 10.5 percent in 1969 to 38.2 percent in 1989—the peak of the previous ivory wars—largely as a result of illegal hunting for ivory. A 1991 elephant conservation plan in Uganda reported a higher-than-normal percentage of tuskless elephants in Queen Elizabeth National Park and singled out poaching as the main cause. Whereas a normal level of tusklessness in an elephant population is somewhere between 3 percent and 4 percent, according to the Ugandan report, a 1989 survey of Queen Elizabeth National Park revealed tusklessness in the elephant population to be between 9 percent and 25 percent. In heavily poached populations, says Poole, the ratio of tuskless animals in the population increases as poaching continues. According to a 2014 report released by the UN Environment Programme and Interpol, 1 kg of raw ivory typically sells for US$750. Each of an elephant’s tusks weighs approximately 5.5 kg; hence, ivory taken from the average elephant and sold on the black market in Asia could fetch as much as US$8,000. In some instances, very large tusks and tusk tips have yielded wholesale prices of more than US$1,000 per kg, especially when ivory is in short supply. “While the illegal ivory trade might enrich a few criminals, it deprives elephant range countries and their people of billions of dollars in revenue through the tourism industry,” says AWF’s Muruthi. In Kenya, where Satao and Mountain Bull were killed, tourism revenue contributes 20 percent to the national GDP. For those tourists on safari in Kenya hoping to see Africa’s Big Five, seeing an elephant in the wild, especially one with large, imposing tusks, is a must on the checklist. But with 302 of Kenya’s elephants cut down by poachers last year, spotting the big-tusked elephant on the savanna may become increasingly rare in the not-so-distant future. “In many ways, elephant poaching is not just a wildlife crime but a crime of economic sabotage,” remarks Muruthi. When it comes to protecting Africa’s elephants from poachers and the demands of the ivory market, most countries, law enforcement agencies, wildlife authorities, and the wider conservation community know what needs to be done. It boils down to this: stop the killing, stop the trafficking, and stop the demand. In other words, stop the poachers on the ground with more anti-poaching patrols, increased security around protected areas, and strong judicial action against convicted poachers and traffickers. Stop wildlife traffickers in their tracks with improved security at ports of entry, better training of customs and border agents, and increased law enforcement coordination between countries. And stop the demand with very visible, very targeted, and very large public awareness campaigns in consumer nations, especially in Asia, where the greatest demand for ivory stems. For its part, AWF is addressing all three of these areas, and no more so than on the ground, where it is partnering with a variety of groups to bolster security around vulnerable elephant populations. In southern Kenya, AWF and Big Life Foundation have trained community scouts to conduct anti-poaching patrols in community areas outside of Amboseli National Park and are working with a Tanzanian-based NGO, Honeyguide Foundation, to coordinate transborder patrols. In those areas where AWF and its partners are working, elephant poaching has been drastically reduced, in some places to zero. In addition, AWF is hosting workshops for local magistrates, lawyers, customs and border agents, revenue authorities, local police, and local communities who are learning for the first time about the breadth of the elephant crisis and the new wildlife laws designed to combat it. Elsewhere on the continent, AWF’s support of a local conservation group in Zambia conducting foot and aerial patrols in and around Lower Zambezi National Park has reduced elephant poaching by half in the area. In Cameroon, where in 2012 hundreds of elephants were slaughtered en masse inside a national park on the border, AWF is now working with the national park authority to provide anti-poaching patrols and faunal surveys in Faro National Park.